THE ROBOT REMEMBERS. Don’t like vacuuming, but also don’t like the idea of criminals knowing where you keep your valuables? iRobot’s got you covered. On Thursday, the robotics company unveiled the newest version of Roomba, the autonomous robotic vacuum cleaner that’s been helping keep homes dust-free since 2002. Unlike previous versions, Roomba i7+ is able to empty itself. Pretty cool! Potentially less cool, depending on how much you value your privacy: the bot also stores images of your home in its internal memory and a map of your home’s layout in the cloud. TO THE CLOUD. 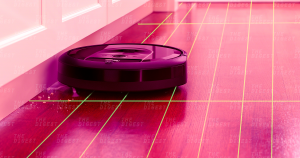 This isn’t the first Roomba capable of mapping the floor plan of its master’s home — iRobot gave the bots that ability back in 2015 to help them navigate homes and cover every foot of floorspace. But those versions deleted the information right away. This one stores it, though the company says protecting user data is its top priority. Clearly, though, iRobot understands that consumers might still be wary. It’s offering another, lower-tech version of the device, which doesn’t include the room-mapping functionality. THE LUDDITE VERSION. This lower-tech version is called the Roomba e5. Unfortunately, the trade-off for not having a map of your home floating around the cloud appears to be having to empty your own vacuum — the e5 doesn’t include the same auto-empty feature of the Roomba i7+. The fact that iRobot even bothered to create the e5 could be sign that device manufacturers are aware of consumers’ concerns over privacy. We could be heading toward a future in which it’s common practice to release two versions of the same device — one has all the fancy bells and whistles, while the other puts user privacy at a premium.